This year’s All-Star Game saw brand-new technology in use for the first time in the KHL: the players took to the ice with special microchips in their jerseys to measure the speed and distance they covered during the action. Similar chips were in every puck used at the Skill Show and All-Star Game. Over the weekend in Kazan, the league wanted to test this new data collection system. The KHL is considering implementing this kind of ‘smart puck’ technology at all games in the championship in order to enhance the process of collecting and analyzing statistical data. Over the two days, the system generated 7,852,400 pieces of data. The teams skated a combined total of 172,089.55 meters and the puck was under control for 39,430.39 seconds. 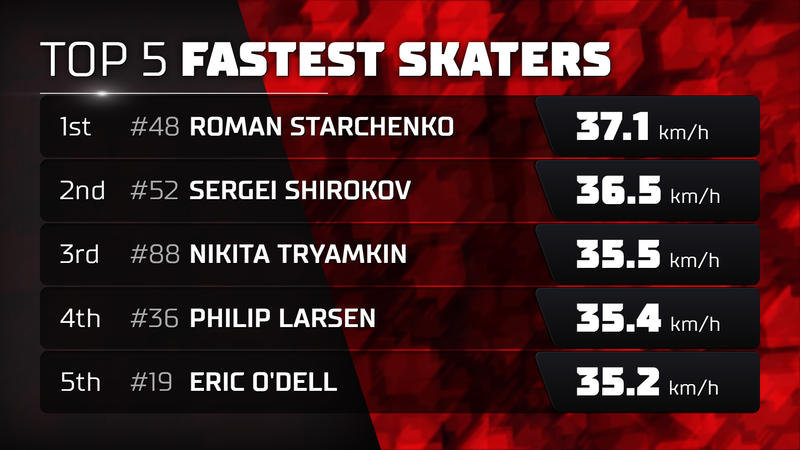 The highest recorded skater speed was 40.32 km/h from Dmitry Kagarlitsky during the skill show. As well as the chips themselves in the puck and uniforms, the system also relies on sensor installed around the edge of the ice. These sensors gather data from the chips in real time. That data stream is backed by an AI-based analytical platform. The whole system is fully automated and requires no additional work in the arena. During a typical game, more than 5 million data points can be analyzed, producing a wealth of statistical information that cannot be calculated manually. The chips themselves are highly durable and consume little power. They would not need to be replaced over the course of a season. If the data stream from the pucks is interrupted, an alert is immediately transmitted to the officials’ bench and the puck can be replaced. Let’s take a look at the final game, where Team Chernyshev defeated Team Bobrov 4-3. 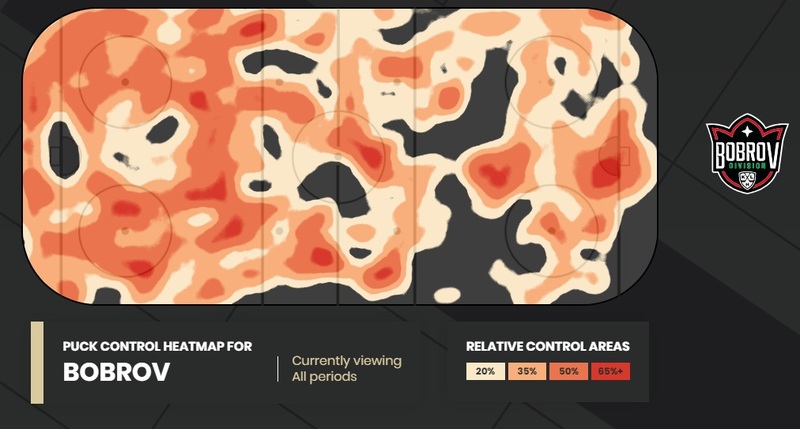 The data from the puck makes it possible to see exactly how much time each team spent in possession of the puck, while a heat map highlights the movements of each player when he had the puck. We can see that Team Chernyshev looked to play the puck in every area of the ice, while Team Bobrov sought to pass the puck quickly through center ice. The smart puck also generates information about every shot. It can record where the shot was taken, the speed at which the puck left the stick. It also collects data about blocked shots, distinguishing between saves made by the goalie and blocks made by skaters, and recording the speed of the puck when its flight was halted. And that’s not all. There’s information about how far the puck travelled in each period. Combined with data about the overall movements of the players, this highlights the most intense battle grounds in each game. Information about face-offs is presented in a new way, dividing the ice into five sectors to show whether teams performed better on offensive, defensive or neutral zone draws. 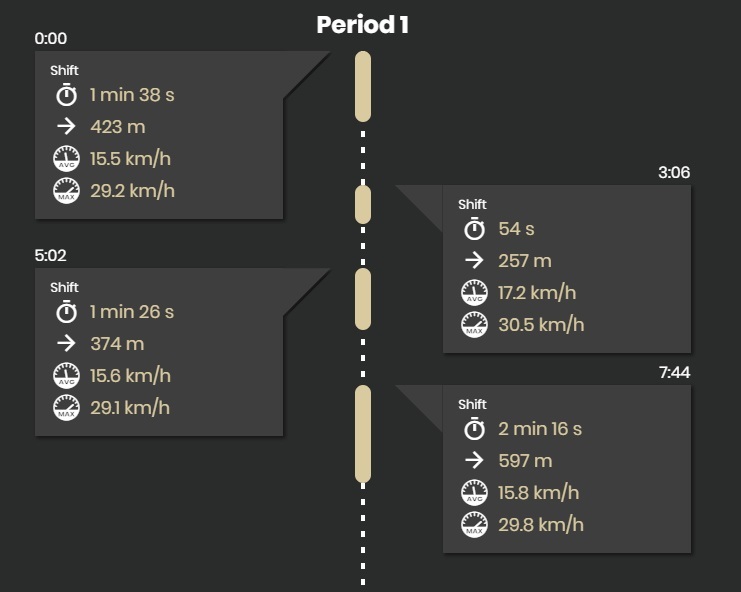 The chips in the players’ jerseys generate information about each player’s movements, specifically how long each shift lasted, his average and maximum speeds during each shift and the distance he covered. This system can measure the players’ performance from the moment he steps onto the ice to the moment he returns to the bench. At the All-Star Game there were no penalties but in regular action the system would automatically be informed of every stint in the sin bin. In addition, there is real-time information about which players are on the ice and for how long. Thus, it is possible to have detailed information about how long each player was on the ice – for both teams – every time a goal is scored. Working together, the chips in the jerseys and pucks can create an online game view in real time. This makes it easy to see the tactics of the different teams, how they like to move the puck out of their zone and how they prefer to set up their power plays. Sunday’s four games provided unique information that enabled us to identify the top players according to a whole new set of statistical data. 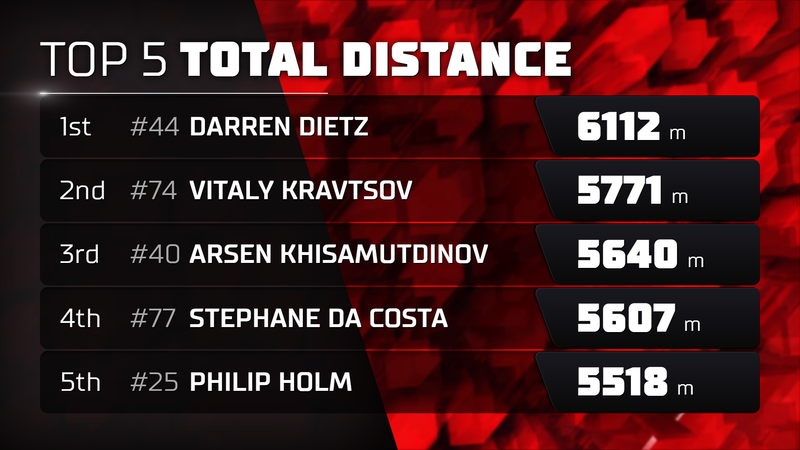 The top results came from two players with Barys Astana: forward Roman Starchenko clocked the fastest speed at 37.1 km/h while defenseman Darren Dietzcovered 6,112m on the ice. In addition, the special chip in the puck provided information about the hardest shots in the mini tournament. The winner in this category was young Mark Verba of Russkiye Vityazi and Team Chernyshev. 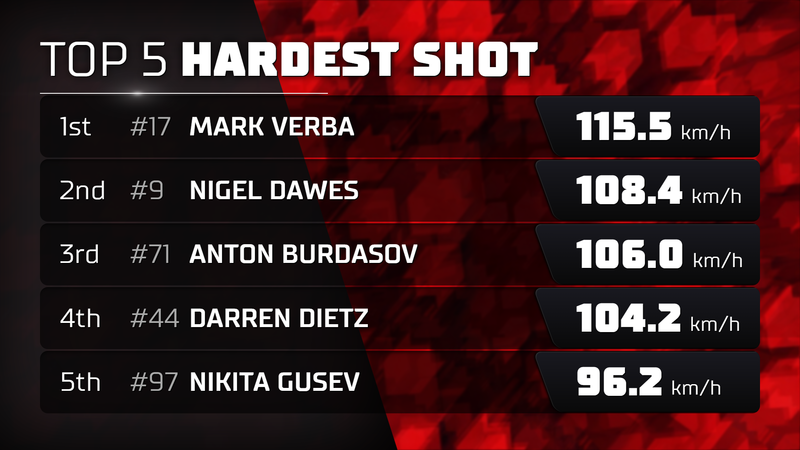 His hardest effort flew at 115.5km/h. To conclude, here’s a full list of all the personal data for every player who took part in Sunday’s games.